191 cereals start with the letter "S"
This cereal was described on the front of the box as an "artificial strawberry flavored rice cereal." 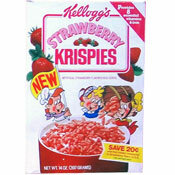 Just as Cocoa Krispies consist of chocolate flavored, brown crisp rice, Strawberry Krispies was strawberry flavored, pinkish red crisp rice. More Cereals That Start with "S"